Mr. Stute is a Managing Director and Head of Specialty Finance in the investment banking group at Hovde Group and is based in the firm’s McLean, Virginia office. 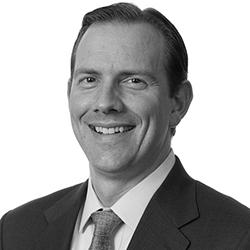 Prior to joining Hovde, he was a member of Houlihan Lokey’s Financial Institutions Group. He has nearly 20 years of experience providing capital markets and M&A advisory services to the financial institutions sector, with a particular emphasis on the specialty finance industry, including equipment leasing companies, asset-based lenders, accounts receivable factoring companies, and non-mortgage consumer lenders. Before joining Houlihan Lokey, Mr. Stute was a Managing Director and Principal at Milestone Advisors, LLC in Washington, D.C., which was acquired by Houlihan Lokey in 2012. While at Houlihan Lokey, and previously at Milestone Advisors, Stute was a top ranked senior banker in the specialty finance M&A sector, as measured by number of deals (according to SNL Financial LC, 2004 to 2016). Prior to joining Milestone in 2001, Mr. Stute was an Associate in the Financial Institutions Group of First Union Securities, Inc. (now Wells Fargo Securities, Inc.) in Charlotte, N.C. Mr. Stute holds a B.S. in Finance from Wake Forest University. Mr. Stute is licensed with the Financial Industry Regulatory Authority as a registered representative and holds the following licenses: Series 7, 63, and 79.